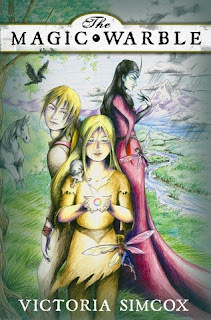 Recommended to: Young readers looking for a foray into fantasy. What first attracted my attention about The Magic Warble was the mention of dwarfs, gnomes, and all other manner of fantasy creatures. Ever since I was a young reader these beings were the stuff of magic for me. I was anxious to see where Victoria Simcox would take us. What next drew me in was of course the cover. Hand drawn covers are few and far between now, so it was a breath of fresh air for me. From page one I fell in love with Kristina, our main character. Very much the underdog in this story, I see a lot of younger readers identifying with her. She is a bit quiet, smart, but doesn't seem to have many friends. Lucky for Kristina she has an amazing teacher that she looks up to, as well as a tried and true pal in her friend Raymond, who also happens to be a rat! Kristina is feisty, but still believable as a twelve year old girl. There are moments of bravery, and moments of weakness, just like any human character. However she still shines through as a hero, and that's what is important. Now comes the part where I was a little bit torn. Besides Kristina, all the other characters seemed to be a little bit flat to me. Almost as if Kristina was the only character who really mattered when, in actuality, many of them are very important to the story. I admit that I am an older reader who is very motivated by character development, so this was a big deal to me. However, after I took a step back, I saw that perhaps a younger reader wouldn't really see what I saw. Kristina is, after all, the hero. If she takes the spotlight then I suppose that's what the hero is supposed to do. It slightly hampered my own reading of the book but then again I'm not the target audience. The other element that really made it difficult for me to fall in love with The Magic Warble was the writing. It is very simplistic, which would likely be fantastic for young readers but was difficult for me. There were multiple times in a paragraph that a sentence would start with the same word, which created a very repetitive read. Also, the dialogue between the characters felt very one dimensional to me, and devoid of any emotion. You know the inner voice that we readers have? The one that dictates how we would read the book out loud? It was rather monotone, and that saddened me. I would have loved to see feisty Kristina come alive on the page as she fought to save the day. In terms of setting, however, the world of Bernovem is rich, vivid, and really the key factor in my rating for this book. When I read a fantasy book I want to be whisked away into another place. I love to see somewhere new and exciting bleed off the pages and into my imagination. I truly believe that Simcox accomplished this beautifully. Bernovem is populated with all types of fantasy creatures, and readers will love learning about the land as they follow Kristina on her adventures. The black and white illustrations that pepper the book really help bring it all to life. Overall, what I'm trying to say in this very rambling review is that I did enjoy The Magic Warble as a whole. I read a lot of middle grade fiction, and I can honestly say that this would make a happy home in any child's library. The crossover appeal may not be there entirely, but I would say that a book like this would be perfect for a family to read together. Just enough adventure, the right amount of bravery, and a little bit of love. That is the recipe for The Magic Warble, and I thank Victoria Simcox for giving me the opportunity to find that out.